Developed from the Supacat designed Jackal 2, the Coyote differs from the Jackal through the addition of an extra axle, turning the machine into a 6X6 design. Its primary role is that of an artillery tractor, with secondary roles of battlefield reconnaissance and assult. It can be fitted with either a .50 Cal heavy machine gun or a 40mm grenade launcher as its primary armament, with general purpose machine gun as a supporting weapon. Both the Jackal and the Coyote have seen extensive use in Afghanistan where it had proved to be a very useful machine, becoming much loved by its crews. 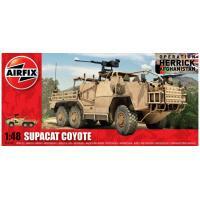 This kit can be modified and enhanced providing even further detail for the superb Supacat Coyote, with the A65002 British Forces Jackal and Coyote Photoetched Accessory Parts 1:48.